My college days may be behind me, however, I know the feeling of waking up in the morning and trying to figure out if any of my 35 calls connected to the people I called, frantically checking through my call log to see if any calls lasted longer than the time for no one to answer. Then calling back my friends and apologizing for the 35 minute calls we had at 3am. 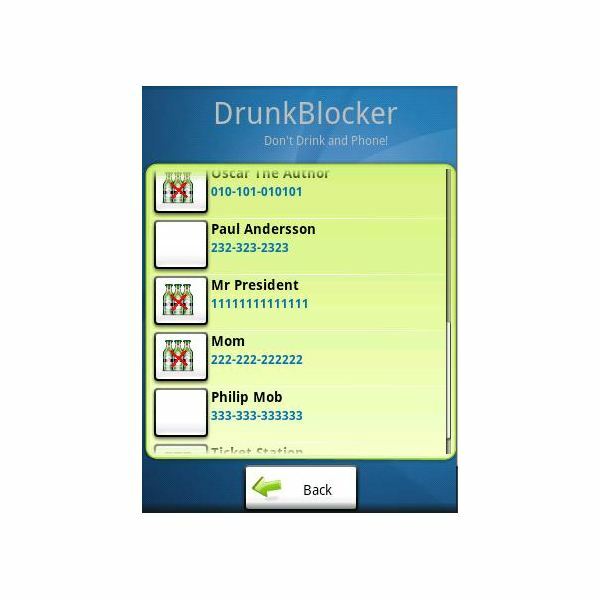 I just wish that Drunk Blocker existed when I was in college. This fun yet useful application works by having the user set a list of numbers they want to be restricted once they put the application into drinking mode. Users choose the contacts they want to avoid, then time they plan to start drinking and ultimately the time they believe they will be sober. For test purposes I set the device for a drinking time of 8pm and a sober time of 8am. Since the application only restricts the numbers you choose you don't have to worry about restricting emergency numbers such as 911 or the numbers to local cab companies to get you home, a very important consideration if you drink enough that you don't want to be able to call certain people. 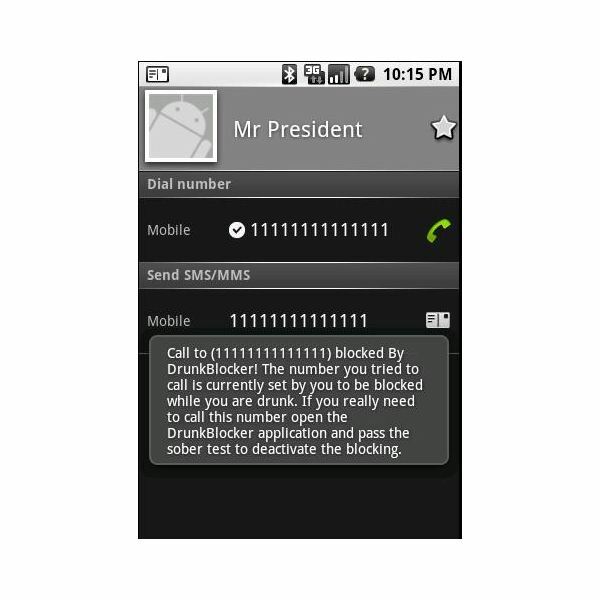 So what happens if you try to send a text message or call a number on your blocked list. 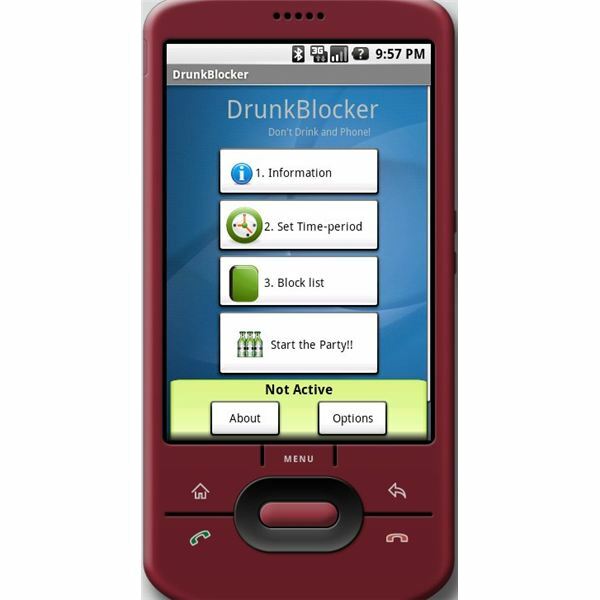 First the application lets you know that the number is being protected by drunk blocker, next it tells you that you need to open the application and pass the included sobriety test. For many drunk users just finding the application to opening it may end their journey. The questions are pretty tricky to answer when you're drunk so don't let them fool you when your sober. 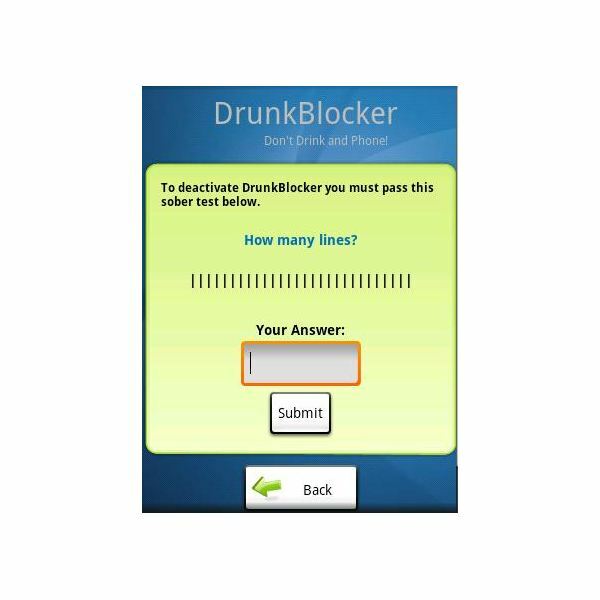 Drunk Blocker is a goofy little application that I laughed about when I first read about it, however, after actually using the application I found it to be a very useful application that didn't complete restrict my device as I thought it would. Check it out on the Android Market and I'm convinced you'll be showing it off to your friends and having a good laugh over it in no time at all.